In Uncategorized, Veggies, What In Tarnation? 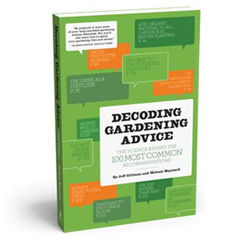 You know me: I often write about the prevalence of bad gardening advice so, hey, here I go again. This time, let’s talk about how often we gardeners hear stuff that’s either dangerous, or stupid or both. Got a tree stump you need to remove? “Pour gasoline on it,” I’ve heard more than one gardener advise. PLEASE don’t do that. Need to get rid of moles? “Stuff Juicy Fruit chewing gum in their holes,” advise ill-informed people who believe the story that the gum, lord knows how many sticks, will cause intestinal blockage. It won’t, but even if it did, don’t do this either. And here’s another thing you ought not do—use mothballs outdoors. (Honestly, though, who wants to wear sweaters and use blankets that smell like mothballs either?) Anyway, I have no idea who first started running about telling gardeners that mothballs are great for curtailing outdoor pest problems, but the strategy has been around a long time and is still going strong, according to my latest Google search. The trouble is, though it does work, it’s a federal offense to use mothballs for an off-label reason such as animal control. And there are a lot of good reasons for that. Regulated by the U.S. Environmental Protection Agency, mothballs are pesticides capable of harming all living things, including children and pets who may mistakenly eat them thinking they’re some kind of treat. Mothballs are also harmful to the environment because, as they deteriorate, they contaminate groundwater, soil and plants (the pesticides in mothballs bind to soil and are taken up by plants). One of the many brands of mothballs for sale. Labeled for use to kill moths and other pests that destroy fabric, mothballs are supposed to be used only in airtight containers. That’s because the vapor from their active ingredient, usually naphthalene or paradichlorobenzene , is toxic. As the fumes build up inside a closed container, the pesticide reaches a level that kills the moths. When we smell the terrible stink of mothballs, however, we are the ones breathing in the pesticide fumes. And those fumes can affect our health in truly sucky ways, depending on which active ingredient the mothballs contain. Adults exposed to naphthalene or paradichlorobenzene vapors for short periods, for example, may experience nausea, dizziness, headaches and/or vomiting. Longer exposure has been linked to the development of hemolytic anemia, as well as kidney and liver damage. Naphthalene, according to the World Health Organization, may also cause cancer. Young children exposed to mothballs containing either pesticide can develop fever, diarrhea and abdominal pain, especially if they have eaten them. Dogs who ingest naphthalene mothballs may become lethargic or experience diarrhea or tremors. Paradichlorobenzene mothballs have been linked to kidney and liver damage in pets. If you want to learn more about the health effects of mothballs, go to the National Pesticide Information Center’s website.